Happened to notice that since I'd last checked, Wikipedia's fountain pen history article now contains the claim that Romanian polymath Petrache Poenaru invented the fountain pen (or the ink cartridge fountain pen). 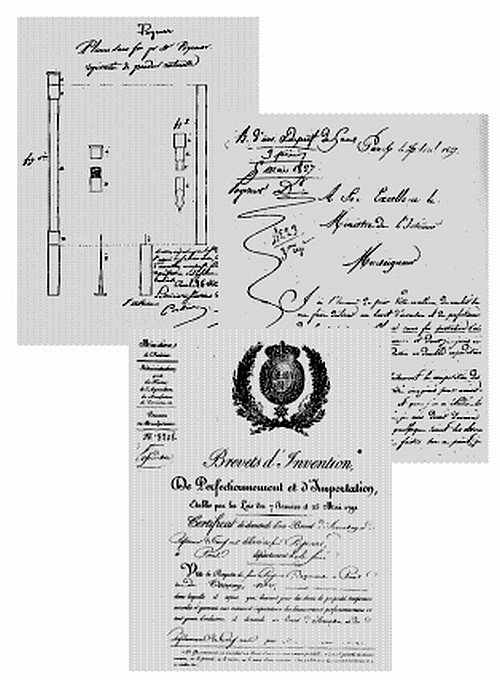 A bit more digging turns up the repeated online claim that Poenaru received a French patent for his pen on May 25, 1827. It is obvious that Poenaru did not invent the first fountain pen, since others appeared far earlier. But what I would like to know is exactly what he did invent. At this site, I found a very small image of the patent, where it is identified as nr. 3208 / 25.05.1827. Can anyone help out with a link to a larger, fully readable image? I saw this claim as well, but it should be easy to find since it's a French patent. Perhaps some FPN members in France might be able to track it down. It's curious that the patent does not appear in Georges Sénéchal's book, L’Industrie Des Porte-Plume Réservoirs En France (1911), a chronological list of French patents. I wonder whether this "tank pen" is a true cartridge fountain pen, or just a Bion-type pen with extra replaceable reservoir barrels filled with ink and sealed up with little screw caps so that they could be carried in reserve. The Google translation of the Poenaru patent website is not very good, but it gives you a general idea. Does anyone out there speak Romanian? Maybe you can give us a better translation. Edited by rhr, 09 August 2010 - 06:29. The text isn't hard to understand -- Romanian isn't that tough to figure out if your Romance languages are good. The problem is that it doesn't tell us anything very specific about the patent's contents. I don't like to argue from negatives, but I can't but find some significance in the patent's near-total obscurity. Early historians of the fountain pen do not mention it; subsequent patents (and patent litigation) make no reference to it. PS From the tiny image shown, I do wonder if the pen is in fact a stylographic design rather than a nibbed pen. Edited by Vintagepens, 09 August 2010 - 21:28. Actually, no Romanian is required to figure out the patent's title, which is given in French, "Plume portable sans fin, qui elle-meme s'alimente avec de l'encre", which translates to something like, "Portable pen without end, which feeds itself with ink", or "Portable fountain pen, which is self-feeding", and by contraction "Portable self-feeding fountain pen". Perhaps the patent's obscurity can be explained by xenophobia. His fate is similar to that suffered by all foreigners outside their own countries. He was ignored and ostracized and wasn't taken seriously, and consequently, he got swept under the rug. The tiny image shown can be made slightly larger in Firefox, but still not fully readable. If you place the cursor over the image and right click with the mouse, then click on "View Image", the image doubles in size. You can then save it and blow it up, somewhat, with Photoshop, but it doesn't bear much magnification. It doesn't look like a stylograph but rather a nibbed pen with what possibly might be a wire that fits into the feed channel as an ink-flow shut-off valve. Edited by rhr, 10 August 2010 - 03:40. I have found some bigger pictures of the patent. I think it is not right to speak about Poenaru as "another pretender" and I think it is time that the western world stops thinking that it is the alpha and the omega. Well, if the world is divided into east and west, Romania as part of Europe probably falls in the west. Unless we in the "east" and "west" want to think that together we're the alpha and omega, and ignore most of the rest of the world. Here is a bit of an update. The Wikipedia fountain pen history section has, since the original post, been edited to tone down the claims regarding Poenaru's invention. The link to the site where I originally found the small patent image has changed slightly; it is now at http://www.poenari.r...ovestea-Poenari. What I failed to note at the time was that this page is part of a commercial site for a Romanian penmaker, using the Poenari name. You can see the Google-translated version of the www.poenari.com site here. While the site doesn't explicitly claim a connection to Poenaru, it does embrace and celebrate him. George suggested that Poenaru's invention was ignored out of xenophobia. Eduardp also seems to think that anti-Romanian prejudice is at work here. That certainly could be true as regards the work of the early historians of French writing instruments. It is equally certainly not the case in this particular thread. Our goal is to find out what he really invented. The eHow article is unfortunately of no assistance, as it makes huge claims which are completely unsupported. It would appear to come from the same source as the now-redacted passage in Wikipedia. A bit of a bump here. A Romanian colleague at work, who noticed that I use fountain pens, directed me to Poenaru's wikipedia entry -- are there any further developments regarding this? From what i read on wikipedia, Poenaru wasn`t the first to create some type of fountain pen, but appears to have invented the "first fountain pen with a replaceable ink cartridge on May 25, 1827"- Staff writer, Canadian Intellectual Property Office. "Centenary of the Romanian Patent Office". WIPO magazine (Geneva, Switzerland: World Intellectual Property Organization) 2006 (1): 15. This could lead to another argument regarding the invention of the replaceable ink cartridge in fountain pens. The fact that Poenaru`s contribution to the development of the fountain pen is ignored or mocked doesn`t surprise me at all. This dilemma will be solved after someone does a bit of research on the subject by seeing the documents in person. Unfortunately, i don`t live in France. Poenaru...appears to have invented the "first fountain pen with a replaceable ink cartridge on May 25, 1827"--Staff writer, Canadian Intellectual Property Office, "Centenary of the Romanian Patent Office", WIPO Magazine (Geneva, Switzerland: World Intellectual Property Organization) 2006 (1): 15. Thanks, Mr. Rochester. Indeed, this would be a very interesting development, if it were true. But I just looked for that issue of WIPO Magazine, and I couldn't find your quoted line anywhere in the article, and certainly not on the page you cited. Here's the whole issue on PDF, and here's the online version of the article. Nothing is said there about cartridge pens. Instead, on page 15, we find a list titled "Romanian Inventors: Some Historical Achievements" including the entry with no illustration, "Petrache Poenaru (1799-1875), engineer and mathematician, patented in 1827 the 'carry on pen that is self-supplied endlessly with ink'--the ancestor of the fountain pen that was improved in 1884 by Waterman". I won't bother with the inaccuracies in that statement, but you probably found that quoted line in the Wikipedia article on "Fountain pen", where it is incorrectly cited with a footnote reference to that issue of WIPO Magazine, footnote 4. I don't know who is responsible for that article, but don't trust everything you find in Wikipedia. I also don't live in France, and from the above pictures, it's hard to tell what's what, so it's imperative for someone in France to locate and get a clear copy of the original patent to confirm or deny that it is a cartridge pen. The patent number is 3,208 from May 25, 1827. Edited by rhr, 26 July 2012 - 02:23. And thank you for your reply, rhr. This goes to show that wikipedia isn`t always accurate. I should have looked for that magazine myself, but never imagined that could actually find a pdf version. I guess this is a debate that will have to be put on hold until new information is retrieved. In any case, i have learned that in what history is concerned, almost nothing is the way it first appears to be. Edited by rochester21, 04 August 2012 - 12:55. This goes to show that wikipedia isn't always accurate. I should have looked for that magazine myself, but never imagined that could actually find a pdf version. Don't be too hard on yourself, Mr. Rochester. The onus for getting it right should fall on those who participate in writing and editing the "Fountain pen" article on Wikipedia. To be absolutely blunt, that "Fountain pen" article is one the worst exceptions to the rule of excellence on Wikipedia. Most of the serious articles there are held to quite a high scholarly standard, but a few of the articles seem to attract factions that are constantly erasing each other's fabrications and replacing them with their own versions of history. I don't know who the "mavens" are who are responsible for writing the "Fountain pen" article, but as in the past, it seems like they consist mostly of collectors who continue to treat Wikipedia as another source of advertizing for their own commercial concerns, and they know very little about history and how to do proper research. Edited by rhr, 06 August 2012 - 07:44. I don't live in France also, Italy is near France, but anyway internet is nearer. That said, as already anticipated in this other discussion, I managed to get the images of the patent thanks to INPI (Institut National de la Propriété Industrielle). First thing to say, the patent numer is not 3,208. It just do not exists. As Steeve Gallizia (from INPI) explained to me, French patents before 1844 have no number. That number is just an internal reference by the French administration. I have to thank him for his kindness in explaining things to me and for the permission to publish the images. 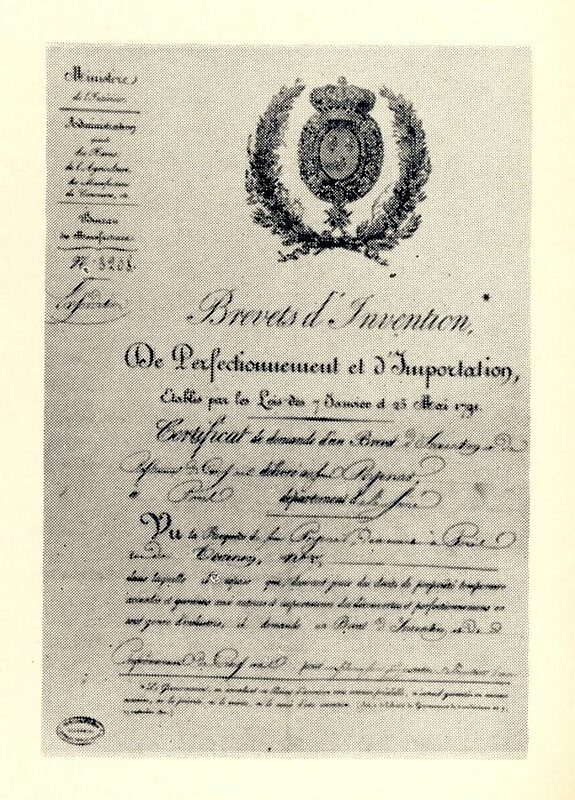 Second thing, the patent was applied by Pierre Poyenar, that seems the French translation of Petrache Poenaru, the 1827-04-26 and granted in 1827-05-25. Third thing to say, the Patent show a kind of fountain pen. Not what I consider an ordinary fountain pen, but that's true also for most of the fountain pen ancestors. That is what I can understand from the description. You can read the patent test in the previuos page. Unfortunately it's in french (and I could have missed some words, it's handwritten). I will translate it in italian someday (but my French is worse than my english), so if someone want to translate it in english I will be glad to publish also the translation. If you find errors I will be glad to know and apply corrections. In my opinion saying he was the fountain pen inventor is quite an exageration, what we call fountain pen now is quite different, but still his invention seems to me far ahead of many other ancestor I saw, and for sure is the earliest one patented. If I had to point to a fountain pen ancestor, I will point to that. Edited by simp, 07 August 2013 - 16:01. I will post a translation shortly of the description. It does not cover a cartridge pen. The main novelty of the design is the use of a large swan quill as the pen's barrel. Explanation of the diagrams on Plate 1 which depict the pen assembled and in its details (the same letters denote the same parts in the different diagrams). Fig. 1 shows the pen closed up in its case and ready to be placed in the pocket like a pencil. It consists of a tube A taken from an ordinary large swan quill of the sort used for making paintbrushes intended for map notes. At the end of this quill tube is fitted a little tube B in thin metal, whose end is threaded on its exterior, and which screws into a cap C, closed on top. The lower end of the tube A is fitted into the upper part of a little tube of thin metal shown in Fig. 2, which has three different diameters D, E, F. The upper part D receives, as we will explain, the lower end of the quill tube A, the lower diameter [step] E is a friction fit with the goose quill G, which is cut like an ordinary quill pen and which can be replaced as desired either by a quill of the same nature or by a metal nib. The middle diameter [step] E is a friction fit, a bit tight, with the end of the cap H, in metal, which covers the quill point G when one no longer wishes to write. At the bottom of this cap is soldered the base of a long needle I whose point, when one caps the nib after having written, goes into the end of the quill G and fits into a little hole of the same diameter as the needle's point drilled in the center of the base of the little end of tube F, to stop the ink from escaping. In this fountain pen [plume sans fin], the quill tube serves as the reservoir, into which the ink is introduced through the end of the quill, all that is necessary is to unscrew the little cap C.
The advantages of this pen over those already existing for the same purpose, being that the tube A is of quill rather than of metal or glass, the instrument is by this means much lighter, less breakable, and to make the ink arrive at the point of the nib, it is not necessary to shake the pen, which is very inconvenient, all that is required is simply to squeeze the tube A with the fingers and the ink will in this manner be made to flow in greater quantity through the little hole drilled in the center of the base of the little holder F, fig. 2. This method also remediates any problems arising from temperature differences between the metals. Edited by Vintagepens, 08 August 2013 - 02:05. That's a good translation, in my poor french I had some problem understanding some parts of the text. If you don't mind I'll put on the patent page (adding credit and reference to here or any other link you prefer). Of course, please add the translation! I should also point out that this pen design is still missing a very important component: the feed. As with the so-called "Bion" pens of the previous century, there really isn't anything controlling the flow of ink -- just a small hole through which it can drip. One funny thing is that the postal address indicated by Pierre Poyenar in this document is "Rue de Tournon" (page 6) ... a famous address known by many pen lovers because André MORA is established there ! How did I miss that! Extraordinaire! Way to go, Simone, and David, and Xof72000.